Could Going Mostly Vegetarian Relieve Acid Reflux? 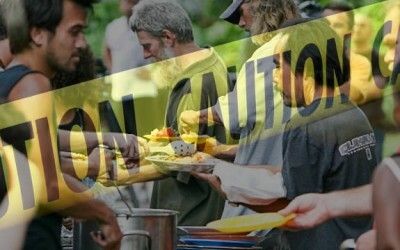 In what amounts to one of the most blatant displays of how truly corrupt the entire hierarchy of the establishment has become, church groups feeding the homeless are now being targeted by law enforcement and local government around the nation. Back on November 29th, I was alerted to the reality that a church group handing out meals for Thanksgiving at a local park had been told by law enforcement to leave or face potential arrest. The story was ultimately read by millions worldwide after it was syndicated from NaturalSociety sister site Storyleak and other news platforms. And while it was truly concerning, I was still under the impression that it must have been a remotely isolated incident. On the night of December 5th, however, I was disturbed to find yet another church coming forward in revealing a complete attack on their ability to feed thousands of homeless men and women. In a story now reiterated by numerous other church heads who continue to contact me through email, a Washington-based church out of Olympia is now facing government attack after handing out more than 5,000 meals per month for the last two years. Now, amid the holiday season, the group known as ‘Crazy Faith Ministries’ has been hit with a bureaucratic siege of red tape for handing out the thousands of meals via a public parking lot. “Although the group has had a long and highly supported presence in the area, complaints began arising regarding issues such as vehicle traffic being blocked from the growing number of hungry people coming to be fed. In October, Charles received notice from the Olympia Police Department that his group would no longer be allowed to use the lot, although unable to cite any law broken. Despite the city’s attempts, Crazy Faith politely declined to comply, saying the lot was the only area available to use. Charles, who is of Native American decent, refused to give up the Native tradition of helping others in his community. That’s right, feeding the homeless now results in significant fines and even jail time — and that is entirely unacceptable. I encourage everyone to share this article and spread the word about the objectively nefarious actions of the law enforcement agencies who are now criminalizing church groups that simply want to feed the homeless. Meanwhile, politicians siphon our income and get away with secret deals that amount to hundreds of millions stolen each and every day. Anthony is a natural health and human empowerment writer, speaker, and entrepreneur whose writings have appeared in #1 USA Today and Wall Street Journal Best-Selling books and top 100 websites. After overcoming Lyme Disease and nerve-related facial paralysis, Anthony's work now reaches several million readers per month through his highly prolific group of social media pages and websites. Focused on self-development techniques and living a healthy lifestyle, Anthony currently sits on the Advisory Board to Natural Society in addition to managing and directing several other companies dedicated to enhancing social good. Anthony's work routinely appears on both alternative and established websites and television programs alike, including Drudge Report, Thom Hartmann, Simple Reminders, RT, Infowars, Michael Savage, Gaiam TV, and many others. You are really saying here that the people feeding hungry people were in the wrong? MMMMM Nazis strike again!Hey wait I have an idea lets round them all up and send them to a camp outside of town so nobody will be bothered by these folks.Just an idea what do you think??? If they’ve been doing this for years, as seems to be the case, then obviously something ‘new’ is going on. I’ll lay odds it’s the muzzies again!!! Honestly they should not be using a parking lot, period. However if using the larking lot disrupts the businesses that the lot supports -which it obviously is since they are getting complaints -then it is detrimental for the businesses which actually have the right to have their customers use their own parking lot. Instead of being smart about it and complying with the citys request -and then working out a practicle solution -they now have shot themselves in the foot. I have no dou t the city wouldve allowed them to work out of a public park or somewhere else that it did not disrupt traffic or business -but by blatantly disregarding the cities request they have not only made an enemy out of a possible ally, but also deserve to lose their battle. Unfortunately they could have truly helped the homeless long term -but instead decided to take a prideful stance and disregard their request. This has absolutely nohing to do with it being a church either. There are many other grouos who do the same thing and guess what they are all required to operate ojt of designated areas with permits. I appreciate what the grouo was trying to accomplish but their own arrogance and pride has just undemined eveverything they were trying to do. I know it’s a foreign concept that public space be used by the public.. as public land is actually one of the three designated FEDERAL lands along with military and Native reservation land… LAME! let’s stop playing their stupid games and start using the common sense we all should have been born with.. the government is supposedly supposed to help people. why wouldn’t it be a logical action of the intervening government to then help the homeless instead of beating up the others trying to help them causing the homeless even more problems?? disgusting.. So instead of reading carefully and getting that it’s true the homeless in this case are ‘disruptive’ and causing traffic problems, you home in on the government and their so-called ‘lack of care’ when people aren’t using their common sense in keeping traffic flowing and not interrupting business. While it’s true they may not have had any other place to go, it’s not exactly as you make it out to be! Hey don’t let that Jew a_no_n person fool you, he’s working with someone to manipulate corruption because he believe in science, which btw is a fraud, it’s nothing but a business, I can tell you the truth about this world in full detail if you like. This a_no_n is one annoying lobbyist jew trying to alter everything and to fool others to push a corrupt organization agenda. Lets just say NASA LIED about EVERYTHING. The world is nothing more than a business. The Numbers on Plastic Bottles: What do Plastic Recycling Symbols Mean?